I’m so excited to introduce you to Wendy Jorre de St Jorre today. She’s been an online friend for almost a year. I love her polymer clay canes, which have quite literally made her famous. 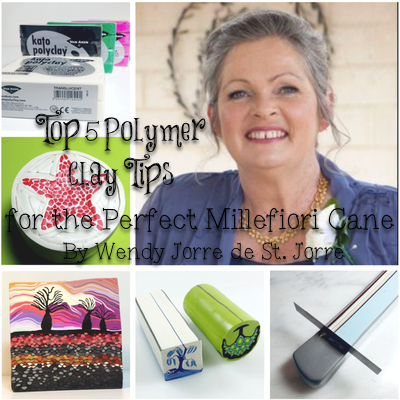 Today, she’s going to share with us her top 5 polymer clay tips to making the perfect millefiori cane. Thanks for joining us today, there is much more fun planned from other polymer clay artists coming up in two weeks. Don’t miss it. Sign up for the emails here. Making polymer clay canes can be a long process, so there is nothing worse than going to all that effort only to have it go wrong at the very end. The following five tips are things that I do to ensure that my canes ‘go to plan’, and to maximise the cane left after reduction. Choose a brand that is suitable for caning and then adjust it where necessary to make all the colours as even as possible in firmness. Clay consistency is definitely the most important thing. Getting the finished cane to reduce evenly is impossible if there are big variations in the firmness of the colours that you are using. Choose a firm brand of clay, the softer ones are too hard to work with. Regardless of the brand you use, there will be some variation in firmness between colours. I soften the harder colours by adding some softer clay when I mix my colours. If I want a pure colour I use translucent to soften it. For colours that are too soft, I will leach them until they are firm enough to use. Spending time getting the firmness of every colour as even as possible will give you the best chance of reducing the cane easily. Packing out your cane neatly and with no gaps will ensure your design stays as you would like it to. A lot of people go to a lot of trouble to make a pretty flower cane only to pack it unevenly. Does a round plug fit a square hole? Often “snakes” of clay are used to pack square or triangular spaces around a design. Yes they will fit in there, but they don’t fit well, so gaps at the corners allow the clay to move and fill the gaps when you reduce the cane. It is much better to use suitably cut pieces of clay that fit the spaces as perfectly as possible. Ensure that your cane stays true to your design by filling gaps with the colours that you choose, rather than letting the cane decide which random colour moves into the gaps. Tip 3: Let the cane rest and even out before you reduce it. The picture on the left shows my cane prior reduction, it has a straight horizon line. On the right, after reduction the horizon is skewed. Why? Because the top half of the cane was too soft compared to the bottom half when I reduced it. Waiting a few days, until all parts of the cane are the same “firmness” will prevent this from happening. The longer it takes to make a cane, the more important this step becomes. If you have made the cane in a few hours reducing it immediately is not a problem. However, if your cane has taken several days to make, the areas you worked on first will be set and unwilling to move having sat still for several days. The areas you finished last will be soft, pliable and ready to stretch as soon as you start. If you attempt to reduce at this stage the soft clay will easily move while the firm clay will resist and you will end up with a wonky cane. Leaving the whole cane to rest for several days will ensure that all parts of the cane are as even as possible. Tip 4: Use registration strips to keep your corners true. Registration strips of grey scrap clay on the corners of the square cane, will show you if your design is starting to skew sideways, or if the shape of your square/rectangle/triangle is changing. On round canes registration strips ensure your cane does not twist. This is more important for square and triangular canes, but even round canes will benefit from at least one registration strip. Registration strips let me know if the design inside the cane is starting to develop a twist, or skewing sideways. By placing registration strips on ALL of the corners of your canes you will be able to see if the design is drifting sideways or if the proportions of your square, rectangle or triangle are changing. Tip 5: Scrap clay can save you a lot of waste. The picture on the left shows my freshly reduced cane, ready to cut. I make the first cut at about the point where the scrap clay meets the coloured clay. In the picture on the right the original cane is now in 3 pieces. Back left is the scrap piece I cut first. Back right is the undistorted cane. The single slice at the front is all I needed to remove to reach the undistorted cane. I use scrap clay at the ends of my canes where most of the distortion occurs. I add 2 layers (maximum thickness on the pasta machine) of scrap clay to both ends (faces) of the cane. Take care not to trap air between the cane and the scrap layer. I add the scrap prior to resting the cane so it firms up with the rest of the cane. Once I reduce the cane down to the size I want, I remove the scrap sections from each end by cutting where the scrap clay meets the coloured part of the cane. Then it’s just a matter of taking one or two more small slices before the undistorted cane is revealed. I love Wendy’s canes, she is a true and unique artist. Thank you to both girls for sharing these tips with us. Great idea for using scrap at the end of canes to keep from distorting. Its always been a problem for me. Thank you. thankyou for the excellent helpful tips on cane making. Thank you for the wonderful advice! A couple of these things I already knew, but most of them were completely new to me! Thanks for the tips. The firmness of the clay and resting before cutting makes sense. I’ll try it next time. Thank you for the interview, Katie, and thank you, Wendy, for such wonderful tips. I especially like No. 5, which is a new one to me. I will definitely use that method on my next cane. So glad to have you stop by Carol! I’m glad you enjoyed the post. Thanks for the advice! I place my cane in the fridge in a sealed container before I cut it, it really helps, but Ive found if thrown in the freezer it causes cracking, so fridge for 5-10 minutes is the best. Yes, you can refrigerate clay to help it cool faster, be sure that you aren’t capturing too much moisture on the cane however or it won’t reduce correctly. Thank you so much for that wonderful advise. You’re welcome Terry – Thanks for stopping. Fantastic advice and very well written! Cheryl, thanks for stopping. I find her advice on caning absolutely top-notch!